Seagulls vs. Crows: Let the Battle Begin!!! | Separated by a common language. « Power to the Pug! Seagulls vs. Crows: Let the Battle Begin!!! I think this was sparked by seeing a seagull standing on the ledge of the Vancouver Art Gallery, and I mentioned how enormous seagulls are out here. Initially, Steve and I guessed a really arbitrary number of 50. Then when we really started to break down how much weight that each bird could handle between them, I think we finally presumed that about 200 seagulls could lift one of us, and that would be if we were on the top of a building, thus already giving us some room to drop in altitude from the initial takeoff. 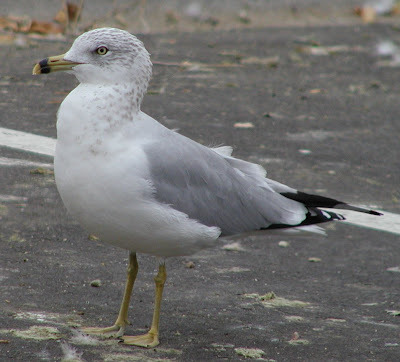 I mean, I think seagulls are probably pretty strong for their size, but their wings aren’t too strong looking. They’re not beefy, like those handsome bald eagles, you know? Then we were thinking about other birds that would be able to carry us. We figured that about 100-150 crows could probably handle a human (sorry PP!). We think that crows are generally smarter than seagulls, and could therefore be trained to pick us up from the ground, rather than lifting us off a building or something. We figure that some kind of tethering device, in some kind of a sled-dog formation ought to be able to keep all the birds in line without actually impeding their ability to fly. I can’t see a net system working too well because you’d have to tie it to their feet for it to actually seem plausible….but then again, we’re talking about using birds as transportation here. Then came the SUPERCROW (as pictured below)! For the sake of science, Supercrow is pictured with a top hat and a monocle, if only to distinguish him from other, regular crows. Now all we need to do is genetically engineer twenty supercrows and train them to fly with a human. Pfft, piece of cake. Yes, that could work, but you will need to fashion each of them with some sort of poop bag so you don’t get crap on your head. You will also need to revise the number of birds required for the task once you account for the weight of their crap. Damnit, I didn’t even THINK of that! This is going to get pretty expensive! This has the makings of a very interesting science experiment. Also, my parents feel reassured about their sanity whenever they read your blog. They are concerned that they resulting air turbulance from close to 200 birds in close vicinity to one another could reduce their lift thus require many many more birds. Are you sure it was just the coffee talking..? This reminds me of ‘James and the Giant Peach’. The author (Roald Dahl) didn’t address the bird crap issue either… it’s a tricky one. Sounds as though you found a good connection for that famous BC bud! Put some in the mail! There is actually now a $15 cup of coffee available in town- so you are already out of date. Steve and I discussed last night that it likely has orphans in it. I have decided that Supercrow is in fact a pigeon. Because crows would just carry you to their lair and peck your eyes on en masse. Yeah! I want to know where this cup of coffee is! You’re right though, it probably has orphans in it! That or at least some kind of endangered species! I think you’d have to make like some kind of major superpigeon, because when I look at a pigeon, I think they look pretty retarded. Their eyes just yell, “DURRRRR!” at me. Exactly! I like how you laid it out in a simple format: NUMBERS! 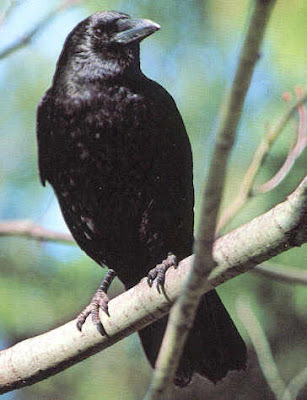 Supercrow looks more like Moriarty in bird form. I wouldn’t trust him to carry me because of that – despite his comically disarming appearance. Storks must be nails if they can carry a single baby all on their own. Supercrow looks like Mr. Peanut. Hmmm…so what kind of illegal substances do you two partake in? hehehe!